FULTON, NY – Merrill K. Hoffman, 88, of Fulton, passed away peacefully on Friday March 31, 2017, surrounded by his family. A quiet and gentle soul, Merrill was born in Johnstown, NY, on November 5, 1928, to Clarence and Bertha (Wagschal) Hoffman. 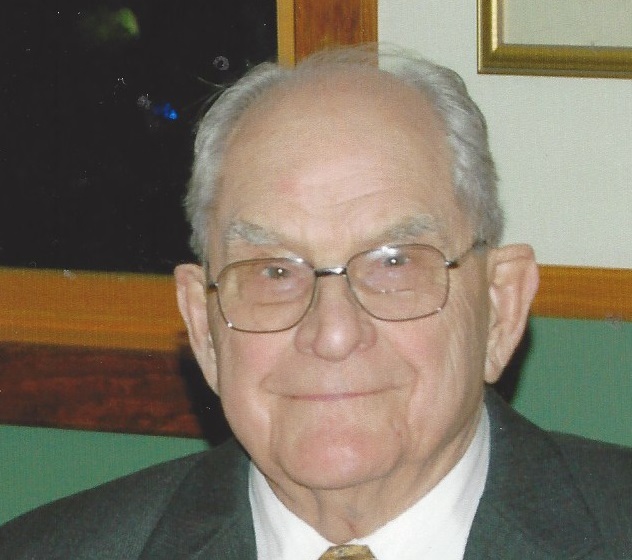 He graduated from Clarkson College of Technology in 1950 with a degree in Mechanical Engineering and always maintained a lifelong pride in being a Clarkson Golden Knight. While at Clarkson, he met the love of his life, Laurna, as they sang together in the Methodist Church Choir. Upon graduation, he worked for his Uncle’s engineering firm in Detroit, Michigan, but in 1951 was called to active duty with the Army. He was honorably discharged in January 1953 and promptly married his sweetheart eleven days later during an ice storm in Jefferson County! They made their home in Dearborn, Michigan. In 1959, they relocated to Fulton where Merrill worked as an engineer at Sealright. Throughout his working life he held positions at Church & Dwight, the City of Fulton, Galson & Galson Engineering and as an independent consultant. He was a proud member of the Fulton Rotary Club and was a recipient of the Paul Harris Award. A lifelong musician, Merrill sang with Oswego Festival Chorus, the Fulton Men’s Chorus and was a dedicated singer in his church choir. He spent many happy years cruising the St. Lawrence River, playing golf, wood-working and traveling, but his greatest joy was his family. He will be deeply missed by his wife, with whom he celebrated 64 years together, Laurna Millard Hoffman; three children, Anne (Gary) Wood of Massachusetts, Peter Hoffman of Baldwinsville and Pamela (Mark) Giovannetti of Fulton; grandchildren, Daniel, Geoffrey and Caroline Wood, Ian and Sophia Giovannetti and Emma Hoffman; two brothers-in-law as well as several nieces and nephews. The family will hold calling hours on Friday, April 7, from 4 to 7 p.m. at Foster Funeral Home, 910 Fay St.
A celebration of life will be held 10:30 a.m. on Saturday, April 8, at First United Church of Fulton, 33 S. Third St.
Memorial contributions may be made to First United Church of Fulton, 33 S. Third St., Fulton, NY 13069 or to the Fulton Rotary Foundation c/o Donald Ross, 8 Riverview Drive, Fulton, NY 13069, in Merrill’s memory.